A group of researchers from the Ecole Polytechnique Federale de Lausanne’s (EPFL) Global Health Institute (GHI) and Inserm (Institut National de la Santé et de la Recherche Médicale, the French government agency for biomedical research) has discovered that a class of chemotherapy drugs originally designed to inhibit key signaling pathways in cancer cells also kills the parasite that causes malaria. The discovery could quickly open up a whole new strategy for combating this deadly disease. The research, published online on March 4, 2011, in the journal Cellular Microbiology, shows that the malaria parasite depends upon a signaling pathway present in the host – initially in liver cells, and then in red blood cells – in order to proliferate. The enzymes active in the signaling pathway are not encoded by the parasite, but rather hijacked by the parasite to serve its own purposes. These same pathways are targeted by a new class of molecules developed for cancer chemotherapy known as kinase inhibitors. When the GHI/Inserm team treated red blood cells infected with malaria with the chemotherapy drug, the parasite was stopped in its tracks. Professor Christian Doerig and his colleagues tested red blood cells infected with Plasmodium falciparum parasites and showed that the specific PAK-MEK signaling pathway was more highly activated in infected cells than in uninfected cells. When they disabled the pathway pharmacologically, the parasite was unable to proliferate and died. Applied in vitro, the chemotherapy drug also killed a rodent version of malaria (P. berghei), in both liver cells and red blood cells. If you can't stop the beta-amyloid protein plaques from forming in Alzheimer's disease patients, then maybe you can help the body rid itself of them instead. At least that's what scientists from New York were hoping for when they found a drug candidate to do just that. Their work appears in a research report online on March 2, 2011, in The FASEB Journal, and shows that a new compound, called "SMER28" stimulated autophagy in rat and mice cells. Autophagy is a process cells use to "clean out" the debris from their interior, including unwanted materials such as the protein aggregates that are hallmarks of Alzheimer's disease. In mice and rat cells, SMER28 effectively slowed down the accumulation of beta-amyloid. "Our work demonstrates that small molecules can be developed as therapies, by activating a cellular function called autophagy, to prevent Alzheimer's disease," said senior author Dr. Paul Greengard, Nobel laureate and director of the Laboratory of Molecular and Cellular Neuroscience at The Rockefeller University in New York, NY. "By increasing our understanding of autophagy, it might be possible to stimulate it pharmacologically or naturally to improve the quality of life for aging people." Using mouse and rat cells, scientists tested various compounds for their ability to reduce the buildup of beta-amyloid by exposing cultured cells to compounds known to activate autophagy. The effects of these compounds were then compared by removing growth factors from the culture medium. Researchers then focused on the most effective compound, which was SMER28, to characterize the cellular components involved in this phenomenon. For that purpose, the effect of SMER28 on beta-amyloid formation was compared using normal cells or cells where the expression of genes known to be involved in autophagy was reduced or abolished. Fumaric acid salts have been in use against severe psoriasis for a long time. About ten years ago, researchers in Bochum, Germany, speculated that they may also have a favorable effect on multiple sclerosis (MS) as a result of their Th2 polarizing mechanisms. In parallel to phase III studies, researchers have been actively searching for the precise effective mechanisms. This has now been achieved by a neuroimmunological group at Bochum: fumaric acid salts detoxify radicals released during the inflammation process. In this way, they protect nerve and glial cells. Neurologists at the Ruhr University Hospital, St. Josef Hospital, working with Professor Ralf Gold, report these findings in the March 3 issue of the leading neurology journal BRAIN. As MS, psoriasis is an auto-immune disease, in which the immune system attacks the body's own cells. In MS, the insulating myelin layer of the axons is destroyed in this way. About ten years ago, the Ruhr University Bochum dermatologist Professor Peter Altmeyer informed his colleague, the neurologist Professor Horst Przuntek, that the mixture of fumaric acid salts registered for treatment of psoriasis under the trade name FUMADERM could possibly exert favorable effects in MS as well. In turn, the Swiss manufacturer Fumapharm sponsored a small study in Bochum. Ten patients were examined for a period of 48 weeks (Schimrigk et al European Journal of Neurology 2006, 13: 604). In parallel to this, Fumapharm supported basic research which Professor Gold then performed at his MS Institute in Göttingen (Schilling et al. Clin. Exp. Immunology 2006; 145: 101-107). After that, the scenario moved rapidly: the US pharmaceutical company BiogenIdec with its focus in MS research took over Fumapharm AG and initiated a successful Phase II study (Kappos, Gold, Lancet 2008; 372: 1463). For years, brain scientists have puzzled over the shadowy role played by the molecule putrescine, which always seems to be present in the brain following an epileptic seizure, but without a clear indication whether it was there to exacerbate brain damage that follows a seizure or protect the brain from it. A new Brown University study unmasks the molecule as squarely on the side of good: It seems to protect against seizures hours later. Putrescine is a foul-smelling organic chemical compound (1,4-diaminobutane or butanediamine) that is related to cadaverine; both are produced by the breakdown of amino acids in living and dead organisms and both are toxic in large doses. The two compounds are largely responsible for the foul odor of putrefying flesh. Putrescine is one in a family of molecules called "polyamines" that are present throughout the body to mediate crucial functions such as cell division. Why they surge in the brain after seizures isn't understood. In a lengthy set of experiments, Brown neuroscientists meticulously traced their activity in the brains of seizure-laden tadpoles. What they found is that putrescine ultimately is converted into the neurotransmitter GABA, which is known to calm brain activity. When the researchers caused a seizure in the tadpoles, they found that the putrescine produced in a first wave of seizures helped tadpoles hold out longer against a second wave of induced seizures. Dr. Carlos Aizenman, assistant professor of neuroscience and senior author of the study published online on March 6, 2011, in the journal Nature Neuroscience, said further research could ultimately produce a drug that targets the process, potentially helping young children with epilepsy. 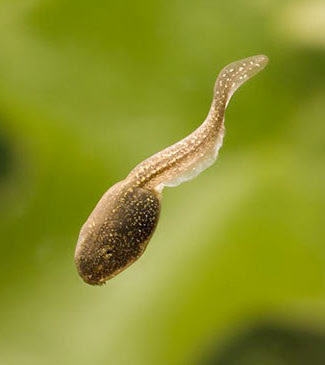 Tadpoles and toddlers aren't much alike, but this basic aspect of their brain chemistry is.